We are located in zone 3A which is a prime migratory path for Kings, Halibut and monster Lingcod. Catch the biggest Lingcod of your life and halibut that will bend your rod like no other. All in 90 feet of water or less! Daily fishing for multiple species including lingcod and rockfish at prime fishing locations within 30 miles of the lodge (which means we can put you on fish within an hour of leaving the lodge). We will filet your catch, vacuum seal it, and hard freeze it for you to take home in your cooler(s) or our fish boxes. Halibut weighing over 100lbs are often called "Whales, Soakers and even Barn Doors". A fletch refers to a large Halibut filet. 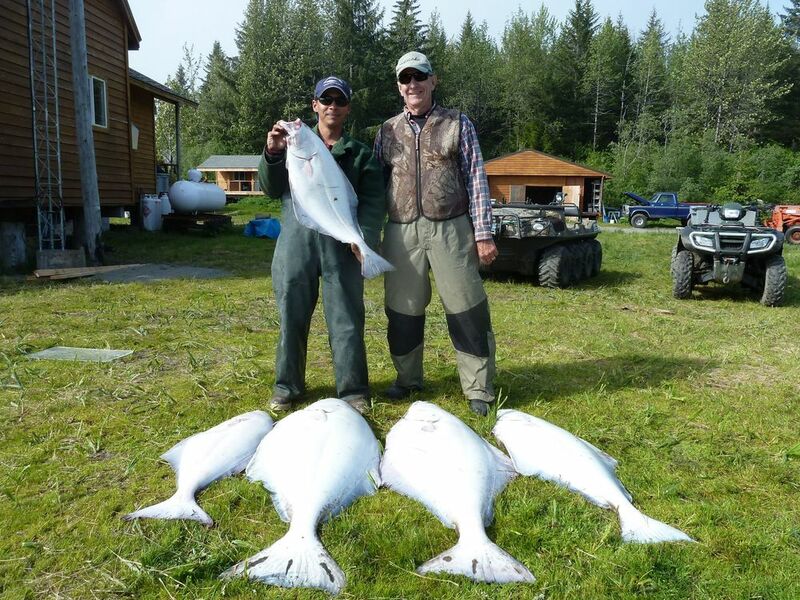 One Halibut will yield 4 fletches. Female Halibut lay 2-3 million eggs annually. King or Chinook Salmon may spend between 1-8 years in the ocean before returning to their natal streams to spawn. The world record King salmon ever caught was a whopping 126 lbs! The King salmon is the state fish of Alaska. Lewis and Clark ate King salmon on their famous expedition and described it as the most delicious fish they ever had. 1 oz of King salmon has 33 calories and 5 grams of protein. King salmon are anadromous meaning they are born in fresh water, spends it's life in salt water, then returns to fresh water to spawn. We are booking for 2019 so give us a call. Not included: Round trip transportation between your home city and Yakutat; Air Taxi service from Yakutat to Icy Bay Lodge; taxes; accommodations in Seattle, Anchorage or Juneau while traveling to or from Icy Bay Lodge, waders and rain gear; personal items (such as toiletries and alcoholic beverages); fishing licenses/stamps & hunting tags; gratuities. Wake up and meet in the main lodge for coffee, home cooked breakfast, and talk about where we might fish that day. Gear up and load up. Start boarding the boat for the days fishing adventure. Each day differs but typically we will go after the daily King limits then move to Halibut, Lingcod or Rockfish depending on clients desires. Return to the lodge to unwind, have a beer, glass of wine or beverage of your choice while our staff filets the days catch and prepares for dinner.